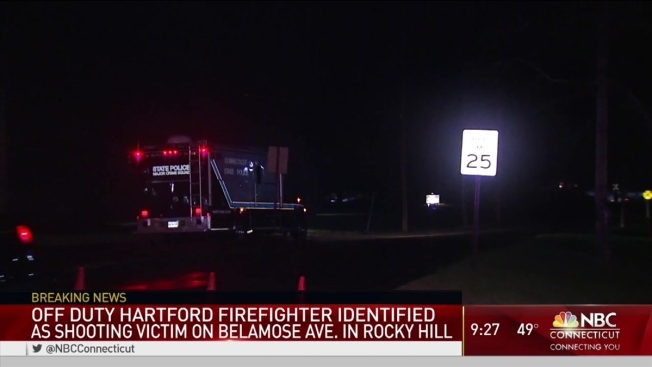 An off-duty Hartford firefighter was shot five times in an industrial park in Rocky Hill on Thursday night and is in serious condition. Hartford Fire Department sources have identified the injured firefighter as Jimmy Ngo. Rocky Hill Police said they were called around 10 p.m. to respond to Belamose Avenue and called in police from Newington and Wethersfield to help search the large 60-acre industrial park, consisting of several businesses, for the victim and shooter. A short time later, officers found Ngo inside one of the businesses in the park. He was seriously injured, officials said. He was shot once in the face and four times in the back. Hartford Fire Captain Raul Ortiz said the victim was off-duty at the time of the shooting. Ngo's current condition is unknown, but he was conscious when he was taken to the hospital for emergency medical care. A law enforcement source told NBC Connecticut that the firefighter is expected to survive. Investigators do not know why Ngo was in the area. Authorities said they have a person of interest, but they have not released the person's name. State Police said this was an isolated incident and there is no threat to the public. Major Crimes detectives are also assisting in the investigation. Investigators said everyone who works in the industrial park should call their employer about work today because the property will be off limits until the investigation at the scene is complete.